WASP Live in the Raw - Brian's first "Explicit Lyrics, Parental Advisory" album. This week we are joined by Thrash It Out podcast host, Brian LeTendre, to talk metal - and in particular to talk about how long-time metal fans feel when their favorite band takes their music in a new direction. Brian discusses the Hysteria album by Def Leppard and the Promised Land album by Queensrÿche. Melinda discusses the infamous "Black Album" by Metallica. Aaron listens to the woe with patience. If you've ever been through a bad band breakup when that sound you love was lost forever, you will definitely appreciate this discussion. You'll laugh, you'll cry, and you'll possibly be offended... but you can still probably relate. Check out Brian's podcasts! If you love metal, or are just interested in learning more about it, we highly recommend them!! Thrash It Out - Where he is joined by Antony Johnston (yes, the guy who created Wasteland!) and they listen to a heavy metal album, and then argue about it. Power Chords Podcast - Brian and Matt Herring discuss rock and metal, and they talk about their favorite bands from the 70s through the 90s. Rock and metal nostalgia from 2 guys who clearly love music! Video: Metallica Mixer Explains Missing Bass on 'And Justice for All' - Ever wonder why "And Justice For All" had no bass? Wonder no more. 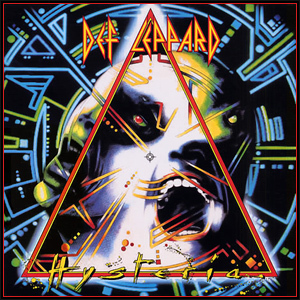 Def Leppard, Ring of Fire - The best Hysteria era song you've probably never heard!